With increasingly inexpensive cloud storage and increasingly powerful cloud processing, the cloud has rapidly become the environment to store and analyze data. Most of the large-scale data computations in the cloud heavily rely on the MapReduce paradigm and its Hadoop implementation. Nevertheless, this exponential growth in popularity has significantly impacted power consumption in cloud infrastructures. In this paper, we focus on MapReduce and we investigate the impact of dynamically scaling the frequency of compute nodes on the performance and energy consumption of a Hadoop cluster. To this end, a series of experiments are conducted to explore the implications of Dynamic Voltage Frequency scaling (DVFS) settings on power consumption in Hadoop-clusters. By adapting existing DVFS governors (i.e., performance, powersave, ondemand, conservative and userspace) in the Hadoop cluster, we observe significant variation in performance and power consumption of the cluster with different applications when applying these governors: the different DVFS settings are only sub-optimal for different MapReduce applications. Furthermore, our results reveal that the current CPU governors do not exactly reflect their design goal and may even become ineffective to manage the power consumption in Hadoop clusters. 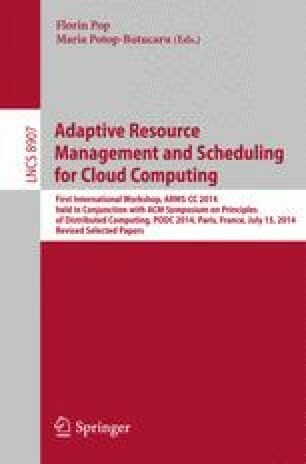 This study aims at providing more clear understanding of the interplay between performance and power management in Hadoop cluster and therefore offers useful insight into designing power-aware techniques for Hadoop systems. This work is supported by the ANR MapReduce grant (ANR-10-SEGI-001) and the Héméra INRIA Large Wingspan-Project (see http://www.grid5000.fr/mediawiki/index.php/Hemera). Experiments presented in this paper were carried out using the Grid’5000 testbed, supported by a scientific interest group hosted by Inria and including CNRS, RENATER and several Universities as well as other organizations (see http://www.grid5000.fr/).